The homeostatic regulation of salt (sodium) and water are basic functions of all organisms. In mammals, hormones such as aldosterone regulate the excretion and retention of water, sodium, chloride, potassium, calcium, and magnesium within the kidneys. Special cellular proteins, called exchangers or ion channels, mediate this water and ion transport. There is therefore a homeostatic relationship between aldosterone, kidney function, and ion channels. Today it is well known that aldosterone crosses the cell membrane and binds to the intracellular mineralocorticoid receptor (MR). Once bound, the aldosterone-MR complex moves to the nucleus and further binds to DNA regions called hormone response elements (HREs), where the complexes act as transcriptional activators or repressors. In some circumstances, this can directly increase the expression (content) of ion channels, however, many other ion channels are modulated through transcriptionally upregulated secondary proteins, such as serum- and glucocorticoid-regulated kinase 1 (SGK1). Fig. 1. Animated schematic of the aldosterone-TRPM7 pathway. Aldosterone freely crosses the membrane and binds to the cytoplasmic mineralocorticoid receptor (MR). Once bound, this aldosterone-MR complex translocates to the nucleus and further binds with hormone response elements (HREs), inducing the transcription of several mRNAs, including serum- and glucocorticoid-regulated kinase 1 (SGK1). The newly synthesized SGK1 mRNA is translated into SGK1 protein, which interacts through with the TRPM7 α-kinase domain to increase the plasma membrane abdunance and total cellular function of TRPM7. Aldosterone, through SGK1, increases the function of ion channels that transport sodium, potassium, and calcium in the aldosterone-sensitive distal nephron (ASDN) of the kidney. However, little is known about the effects of aldosterone on channels that regulate magnesium, an important ion essential for normal cell growth and function. 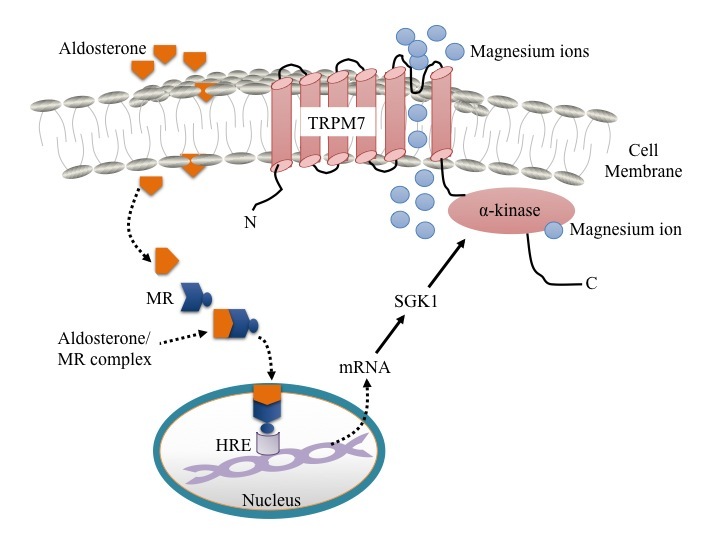 Since the ASDN expresses magnesium permeable transient receptor potential melastatin (TRPM) 6 and 7 ion channels, we questioned whether aldosterone regulates these channels in kidney cells. Because the abundance of TRPM6/7 is low in the kidney in normal conditions, we studied isolated kidney cells in culture – human embryonic kidney 293 (HEK293) cells that overexpress human TRPM7. In our study, we investigated TRPM7 using functional and expression assays. For function, we used previously established whole-cell patch clamp protocols and examined macroscopic currents (electrical activity in cell membranes). For expression, we used antibody-based immunoblotting and further delineated plasma membrane bound TRPM7 (biotinylation) from total cellular TRPM7 (whole-cell lysates). Our results showed that overnight aldosterone application (100 nM) increased macroscopic currents in TRPM7 expressing HEK293 cells. Acute effects of the hormone were not observed, indicating that mechanisms which involve new protein synthesis were likely responsible. Supporting this hypothesis, we found that pharmacological inhibition of the MR blunted the overnight response, as did inhibition of SGK1. Therefore, the molecular pathway involved an aldosterone-MR complex and SGK1 activation. A common mechanism whereby SGK1 activation leads to the increased function of ion channels is via increased plasma membrane abundance. We therefore tested whether SGK1 increased the amount of TRPM7 at the cell surface, leading to increased measurable current. Our results demonstrate that overnight aldosterone application increased the plasma membrane abundance of TRPM7, without any change in total cellular TRPM7 content. Furthermore, blockade of SGK1 prevented the aldosterone-induced increase of plasma membrane bound TRPM7. Thus, aldosterone increases the plasma membrane abundance of TRPM7 by a SGK1-dependent mechanism. TRPM7 is a particularly complex protein, as it is an ion channel fused to an α-kinase domain on its C-terminus, which is known to regulate channel function and signal with other proteins. We therefore used cells with genetically modified TRPM7, where the α-kinase portion was rendered inactive. In these cells, aldosterone was unable to increase TRPM7 current or plasma membrane expression, implying that SGK1 regulates the system through the α-kinase domain. In conclusion, our study shows that aldosterone increases the plasma membrane abundance (and thus total cellular function) of TRPM7 in an SGK1-dependent and α-kinase- dependent manner. These findings are notable because they implicate a magnesium permeable ion channel in a well-known biological cascade that regulates electrolyte homeostasis. As the channel of interest (TRPM7) and the signaling protein (SGK1) are ubiquitously expressed, there are many instances in mammals where these two proteins could interact and alter magnesium transport. Aldosterone Upregulates Transient Receptor Potential Melastatin 7 (TRPM7).